For many of us, the most chaotic part of our life is our home life. We may have tasks completely under control at work, only to have things at home in a tail spin. To-do items don’t get done during the week, and we spend all of Saturday and Sunday frantically catching up. My suggestion: Introduce yourself to FlyLady! I somehow stumbled upon FlyLady and her website about a year or so ago. It has revolutionized my home life. Simply speaking, FlyLady comes up with a plan for keeping your house in order so you don’t have to. She has broken down the areas of your home into “zones,” and concentrates on one zone per week for cleaning and organizing. She also includes a list of things that should be done every day, and sends you reminder emails at the appropriate time. 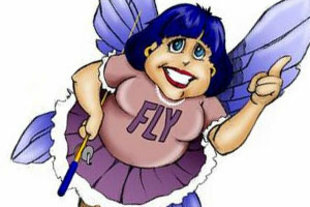 The FlyLady principle is this: It is easier to maintain a clean home than it is to get one clean in a weekend. She also believes that procrastination holds people back, and explains how to defeat this “monster.” Her tips are tried and true. I highly recommend that you give FlyLady a try. You’ll be glad you did! Do you know of any other web sites that focus on home productivity? Thanks for this amazing link. I was trying to find information on how to get this done online and I think I may have passed this site by. Thanks for a great post on a great link.